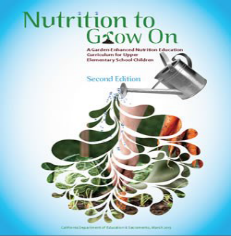 Nutrition to Grow On is an innovative curriculum designed for students in grades 4 and 5 to teach them about food and nutrition through plant-based lessons. Teach students the importance of making healthful food choices and the way in which to do so. Improve student's preferences for fruits and vegetables by giving children an opportunity to work with the land and grow their own produce.